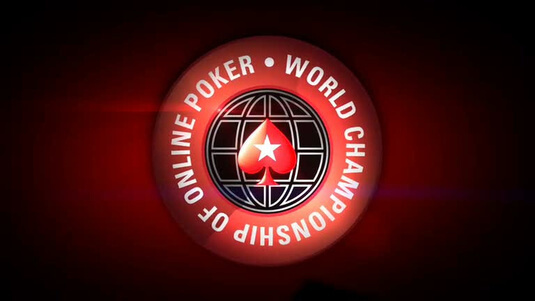 The world’s largest online poker site, PokerStars has announced the schedule for the 2013 World Championship of Online Poker (WCOOP). The tournament will be the largest WCOOP yet, with 66 events guaranteeing $40 million from 8th to 29th September. The online poker event will conclude with the two-day long $5,200 No-Limit Hold’em Main Event. Beginning on 29th September, the Main Event guarantee has increased by $3 million since last year, with an $8 million prize pool to play for and at least $1.25 million for the first place prize. This year’s WCOOP boasts a huge range of buy-ins to suit a range of bankrolls. The levels range from the $109 NL Hold’em Kickoff to the $10,300 High Roller Heads-Up and 8-Game events. Online satellites are currently running on the PokerStars website, allowing lucky players to gain entry to every event for a fraction of the buy-in cost. Poker websites and pros alike have taken to social media to express their excitement. Last year, the WCOOP Main Event was won by Russian player Marat “maratik” Sharafutdinov. Marat entered the Main Event tournament by trading 40 Frequent Player Points on his PokerStars account for a seat in the $5,200 game. After striking a deal on the final table, the micro-stakes grinder took down the championship and banked himself more than $1 million. 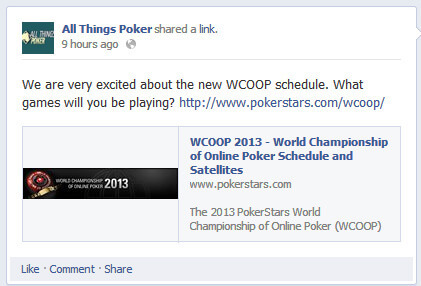 The full schedule for the 2013 World Championship of Online Poker is available to view on the official WCOOP website.